Bindi Irwin Photos, News, and Videos | Just Jared Jr.
Bindi Irwin holds hands with longtime boyfriend Chandler Powell while arriving for their flight at Sydney Airport in Australia on Tuesday (April 2). The longtime couple were joined by a friend as they flew out and headed back to Brisbane to work on the new season of Crikey! It’s The Irwins. Just the night before, Bindi appeared on the Australian version of Dancing With The Stars as a guest judge. Bindi Irwin just announced some pretty cool news – Crikey! It’s The Irwin’s is coming back for a second season! “We are so excited to announce that this year will bring season TWO of Crikey! It’s The Irwins with Animal Planet,” the 20-year-old conservationist shared on her Instagram. Crikey! It’s The Irwins airs Sundays @ 8PM ET/PT on Animal Planet. 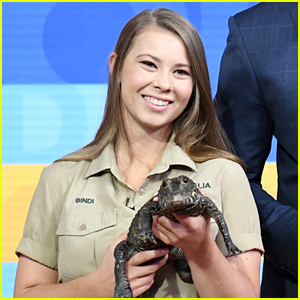 Earlier in the week, Bindi and brother Robert Irwin both made appearances on Good Morning America and The Tonight Show, showcasing some amazing wildlife animals. Bindi Irwin is opening up about life without her father Steve Irwin, who passed away 12 years ago after a stingray attack. The 20-year-old animal conservationist and her little brother Robert spoke to People magazine in their latest issue about the ongoing struggle with heartbreak. Bindi and Robert have been keeping their dad’s legacy very much alive with expanding their Australia Zoo, and spreading the word with their tv shows and more about their conservation efforts. For more from the Irwins, head to PeopleTV.com! Bindi Irwin and boyfriend Chandler Powell snap a selfie with fans while celebrating Steve Irwin Day at Australia Zoo on Thursday (November 15) in Brisbane, Australia. The two Wildlife Warriors marked the legacy of the 20-year-old conservationist’s father, Steve. During the event at the Zoo, Aussie musician Adam Brand performed and was also the latest inductee into the Australia Zoo Walk of Fame. Just the week before, Bindi and Chandler were seen with her mom Terri and brother Robert at the Steve Irwin Gala Dinner. Bindi Irwin cozies up to boyfriend Chandler Powell while arriving for the 2018 Steve Irwin Gala Dinner held at Australia Zoo in Brisbane, Australia over the weekend. The longtime couple were joined by her mom, Terri, and younger brother, Robert, for the annual event. Speaking recently with USA Today, the Irwin family opened up about their new Animal Planet series, Crikey! It’s The Irwins! The series airs Sundays @ 8PM on Animal Planet.